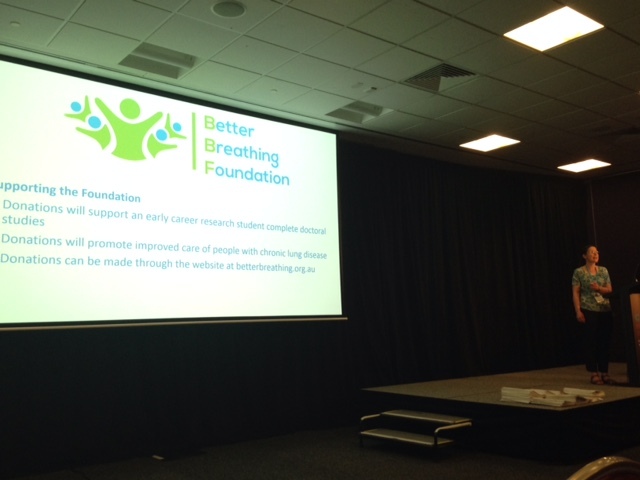 Dr Zoe McKeough had the pleasure of announcing the opening of the Better Breathing Foundation during a cardiorespiratory specific session focusing on exercise training in chronic lung disease, given at the Australian Physiotherapy Conference held on the Gold Coast in October 2015. BBF provides new avenues of funding for early career research students conducting projects in chronic lung disease. For more details about how to get involved with BBF, please visit betterbreathing.org.au or email Zoe at zoe@betterbreathing.org.au. Zoe also indicated that she would be happy to team up with other organisations which are interested in improving the care of people with lung disease. Please email zoe@betterbreathing.org.au if you are interested in supporting the Better Breathing Foundation.